A bit of an announcement time for UK readers! 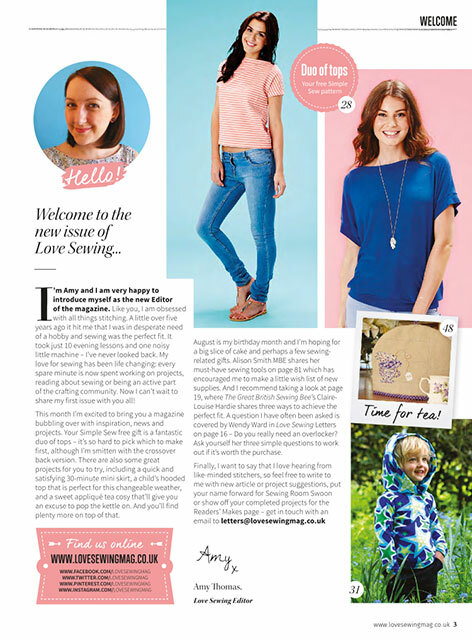 So its very exciting to finally be able to talk about something I’ve known about for a while – that my lovely fellow blogger and pal Amy of Almond Rock is the new editor of one of the UK’s top sewing magazines, Love Sewing. Personally I’m super happy for Amy to get her teeth into this amazing new role, and selfishly I’m excited too because with Amy’s focus and knowledge of dressmaking I know the magazine’s in good hands going forward to cater to all levels of sewing experience and interests. 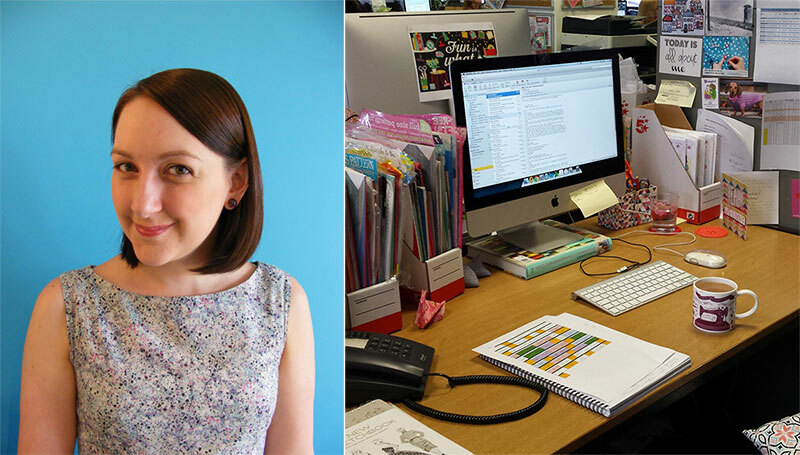 Amy took the time to answer a few questions ahead of her inaugural issue being out today, so here’s a chance to get to know the new editor a bit better. What made you apply for the role of Editor? I saw the link shared by The Sewing Directory and my heart leaped. I had been working in publishing for 8 years but this was my chance to combine my professional skills with my sewing passion. I don’t know how many of you have picked up Love Sewing, but it’s so colourful and joyous and has great contributors. I knew once I got in the door I could really make targeted change to improve the experience for everyone. And I’ve been working with my art editor to make some small design tweaks that we’re pretty chuffed about too. Do you think the magazine can cater for sewists who have moved beyond the beginner level? I’d love it if someone who doesn’t normally read Love Sewing picks up an issue and is impressed enough to buy again! 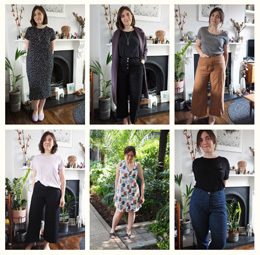 The Simple Sew patterns we include as our free gift won’t always be massively challenging because we want them to be approachable to all skill levels but we want them to be great designs that people are drawn to wearing. I’m really excited about August as the pattern is a 2-in-1 for a cool cross back blouse and a great little jersey top. I want to mimic this inside the mag with as many varied (but achievable) dressmaking projects as possible without compromising on the home or accessories projects everyone loves. The September issue is jam packed with dressmaking content and going forward I am working with the fantastic columnists and feature writers to get thought-provoking articles, in-depth fitting tutorials and the best sewing advice around whether you’re a total newbie or a fully established sewer. Any plans to give up your blog? Hell no! I love that my blog is my own little territory for sharing my projects and chatting with the sewing community directly. Although my sewing time might be a little more squished these days by a longer commute I still have finished garments to share and projects in progress. No one wants a magazine full of my face heheh. I’ve got a shirt for my partner that is long overdue and a two shirtdresses for myself – think of all the buttons! There’s also a nearly complete Sutton blouse waiting for a hem. I’ve also got high hope to whip up a birthday dress for myself as I’ll be 31 at the weekend and would like a fancy frock to wear out to dinner. Hmmm that sounds a bit ambitious right? I love having multiple projects on the go and I’m happy that after 5 years of sewing I’ve gotten quite speedy at the machine when I put my mind to it. Here’s the cover for the September issue, which is out today. And by the way – that stripy top on the cover was stitched up by me! I’ve been taking on a couple of commissions because I don’t actually need all that many more clothes for myself, but my desire to sew all the time is still very much alive. So it’s a nice way to keep me occupied, practice my skills, and earn a bit of cash – for more fabric, obviously. It’s pretty sweet to see something I made professionally modelled and photographed! The crossover-back pattern comes free with the issue, and the candy stripe chambray is from Maud’s. 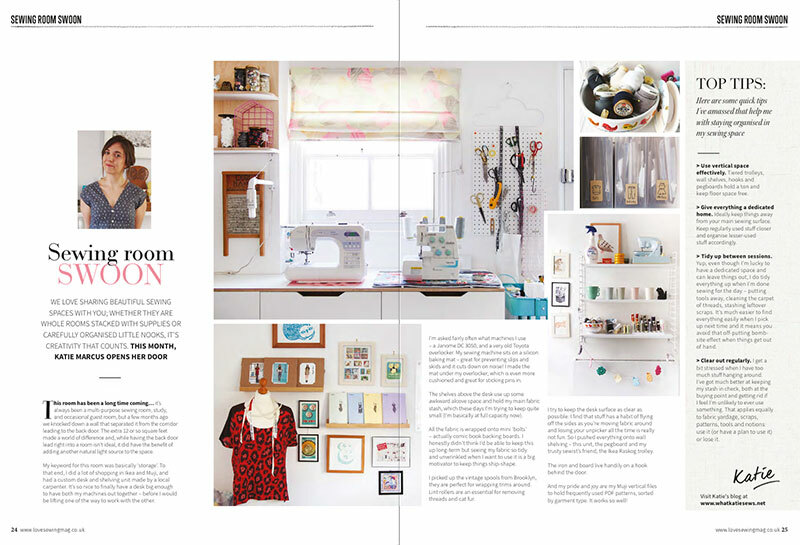 I also submitted some photos of my sewing room to their regular Sewing Room Sneak feature, and the article appears in this issue. Exciting times. 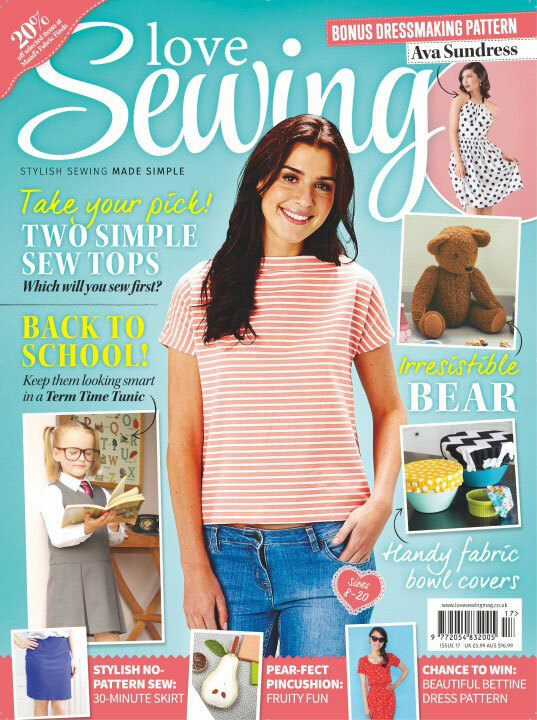 Will you be picking up the new issue of Love Sewing?